Vivienne Laidler with an introduction to acceptance and commitment therapy through the literary work Room on the Broom, by Julia Donaldson and Axel Scheffler; is the popular children’s book a fable of third wave cognitive and behavioural therapy in disguise? Acceptance and commitment therapy (ACT) is a ‘third wave’ cognitive and behavioural therapy that often uses metaphors to demonstrate key therapeutic concepts. Continuing the use of metaphors, the popular 2002 children’s book Room on the Broom provides an introduction to ACT that may be useful for both teaching and clinical work. In this delightful tale, a witch loses several valued items whilst travelling on her life’s journey. She can only reconnect with these items by making room for a variety of animal passengers. The witch navigates further adversity when her broomstick breaks. If we think of the animals as emotions, and the witch’s journey by broomstick as her travel towards her values, then this story can bring to life the theory and practice of ACT. We start by discovering what the witch cares about. Her tall hat, long plait and wand could represent valued actions; particular goals or behaviours that take her towards her values. Our values are like a compass direction guiding our actions (Hayes et al., 1999), and we can move towards our values in many different ways. Life soon brings challenges: ‘the wind blew so wildly it blew off the hat’. Difficult circumstances can take us away from our values. When we try to pursue our valued goals, difficult feelings may show up. Emotions are an integral part of caring; if we care, we open ourselves up to the possibility of worry, sadness, anger, embarrassment, shame, and so on. As the witch seeks her hat, a dog shows up and she is posed a key question: Can she make room for difficult feelings so that she can have this thing she cares about? 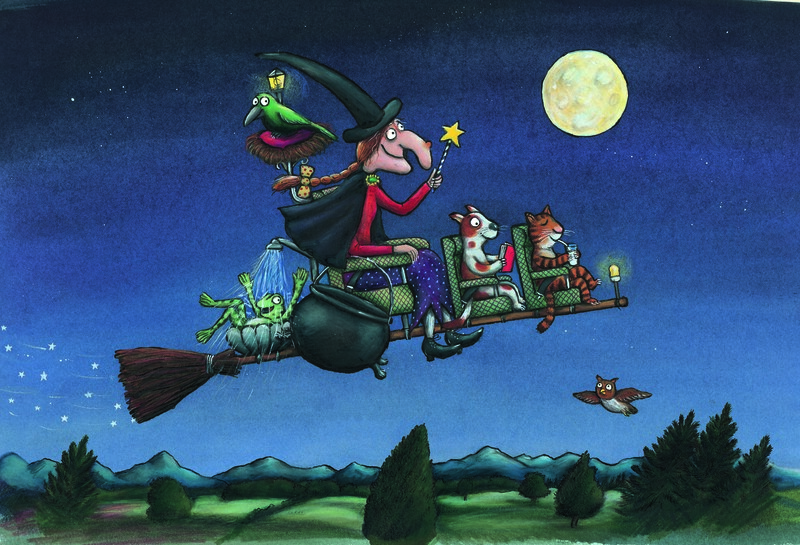 ‘Is there room on the broom for a dog like me?’ The witch is willing to experience difficult feelings: ‘“Yes!” cried the witch, and the dog clambered on’, and this willingness allows her to move towards her values: ‘whoosh! they were gone’. Connecting with values is important, but holding them too tightly can cause problems; for example, other values may become neglected. ‘The witch laughed aloud and held onto her hat, but away blew the bow from her long ginger plait!’ The witch is repeatedly asked to make room for difficult feelings so she can pursue her values. ‘Is there room on the broom for a bird/frog like me?’ She reclaims her valued possessions by making room for more animals; perhaps life might ask if she can make room for fear if it meant she could go back to work; can she make room for pain and frustration if it meant she could play with her grandchildren? But then, the unthinkable happens: ‘the broom snapped in two!’. What about when the witch really can’t pursue her valued goal? We may encounter circumstances that we cannot change, including health problems or disabilities. There may be valued actions that we cannot carry out. It is interesting to look at the witch’s psychological experience, how she becomes stuck, and how she creates a good outcome. The witch encounters adversity and quickly loses sight of her values; perhaps she neglects her relationships or health. She loses direction: ‘the witch’s half-broomstick flew into a cloud’. Scary thoughts turn up for the witch, and are represented by the dragon: ‘the witch heard a roar that was scary and loud’. Perhaps these thoughts are recurring stories for the witch; maybe she feels ‘useless’. The witch fuses with her negative thoughts; she really believes them. She can interact with these thoughts, feel the fire, hear the licking of lips; the dragon seems real. In the same way that the dragon threatens the witch, so too we tend to think of our emotions as dangerous (Luoma et al., 2007). We ‘die of embarrassment’; we are ‘eaten up by worry’. We add a layer of thoughts onto our emotions and, unsurprisingly, become unwilling to experience our feelings. The witch attempts to rid herself of her difficult thoughts and feelings: ‘“No!” cried the witch, flying higher and higher’. Perhaps she tries to think positively, but she finds that her difficult thoughts come back worse: ‘The dragon flew after her, breathing out fire.’ She tries to get away from her thoughts in a different way, ‘flying down to the ground’. Perhaps she avoids challenging situations; but this doesn’t work either: ‘the dragon drew nearer… licking his lips’. So long as the witch is unwilling to have her difficult thoughts, the thoughts chase after her. This encounter illustrates the ACT concept of ‘creative hopelessness’ (Hayes et al., 1999). The aim of creative hopelessness is to help someone notice that trying to control and get rid of unwanted thoughts and feelings might not be helpful. The witch is no longer travelling in a clear valued direction, instead she goes higher, then down to the ground; she is using up her energy trying to get rid of what she doesn’t want. This unworkable action can leave people stuck. The witch’s encounter with the dragon is like the ACT metaphor ‘tug of war with a monster’ (Hayes et al., 1999). Instead of being able to win this fight, it actually restricts the witch from travelling towards her values. ACT suggests that it can be more helpful to drop this struggle. What happens next? Of course, the witch lets go of the struggle and stops fighting her difficult thoughts and feelings. To do this, she needs to be willing to feel her emotions fully and without defence. Within the ACT literature, Harris (2011) invites us to observe emotions as if we are a curious marine biologist observing a rare sea creature. Similarly, in the poem, the witch observes the ‘beast’: ‘It was tall, dark and sticky, and feathered and furred. It had four frightful heads, it had wings like a bird. And its terrible voice, when it started to speak, was a yowl and a growl and a croak and a shriek.’ By owning, observing and making room for emotions, these become less threatening and the witch can make a choice about what to do next. The witch is also willing to meet her difficult thoughts face-to-face. She may name the story ‘Ah, there’s the scary dragon story again’ (Harris, 2011). By doing this, the witch experiments with the ACT process of defusion. She unhooks from her scary thoughts, observing them and letting them pass. This allows her to gain some distance from her thoughts, at which point they may lose their power and influence. This defusion is described in the book: ‘the dragon drew back and he started to shake’; ‘he spread out his wings and was off through the sky’. The illustrations also capture this beautifully: the thought (dragon) is still present in the background; the aim is not to get rid of the thought, but for it to become less central and powerful. Just as the beast protects the witch, our emotions exist to protect us in certain situations. ‘“Thank you, oh thank you!” the grateful witch cried’. In ACT, we may kindly thank our emotions or our thoughts, to help build willingness and defusion. The story introduces the idea of ‘clean’ versus ‘dirty’ discomfort. ‘Clean’ discomfort involves having our emotions as they are, without adding to them by trying to control or evaluate them (Hayes et al., 1999). The witch experiences ‘clean’ discomfort now that she has defused from her difficult thoughts; the emotions (cat, dog, frog and bird) wash themselves clean. At this point, the witch demonstrates the central ACT concept of ‘psychological flexibility’. She is willing to have her emotions as they are, and she is defused from her thoughts, which are in the background. If she can also connect with the present moment, this will enable her to recognise opportunities and make small moves towards her values. Looking closely at the pictures without getting drawn to the dragon, the animals or the witch herself, we can notice the pine cone, stick, bone and lily. These represent opportunities for the witch, and are about to become important. The witch creates a potion using these opportunities, which, as we now expect, have associated emotions: ‘the frog found a lily, the cat found a cone, the bird found a twig and the dog found a bone’. The witch demonstrates committed action; she gets back on with moving towards her values, even after she has gone off-track. The witch puts together these small patterns of action to create a ‘truly magnificent broom’, which represents her new valued journey that allows for all her feelings. These may include sadness that things aren’t the same as before, or regret that she hasn’t made changes sooner (Harris, 2009). ACT uses a ‘passengers on the bus’ analogy. If the witch can make room for the passengers, then she can travel towards her values. Some feelings such as pain might need extra accommodation. The witch may need to do things slightly differently; hence she builds a different style of broomstick. She can follow a new style of movement in her valued direction. How can we measure this successful outcome? All the emotions are still present and are welcomed: ‘seats for the witch and the cat and the dog, a nest for the bird and a shower for the frog’. In ACT, a successful outcome involves acceptance of emotions, and engagement in valued activities. Harris, R. (2011). The reality slap. London: Robinson. Hayes, S.C., Strosahl, K.D. & Wilson, K.G. (1999). Acceptance and commitment therapy: An experiential approach to behaviour change. New York: Guilford. Luoma, J.B., Hayes, S.C. & Walser, R.D. (2007). Learning ACT. Oakland, CA: New Harbinger.